This website is dedicated to help the general public learn more about the Newcastle Hackney Carriage taxi trade and the drivers. We're sure you'll be surprised with the information you'll find out. 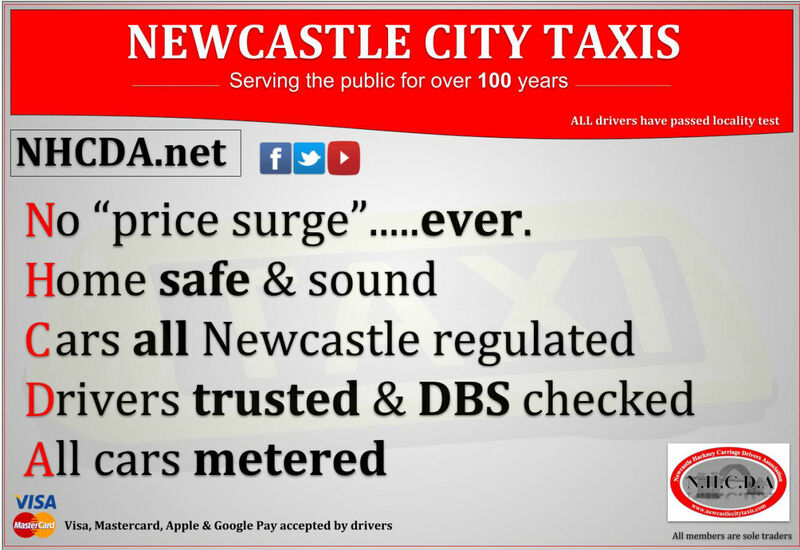 Did you know Newcastle Council set our taxi rates and we have not had a fare increase since September 2013. Surprised? We will NEVER price surge unlike Uber. We only have 2 tariffs and don't increase fares over Bank Holiday periods. Most taxi drivers now accept Visa, Mastercard, Apple and Android pay. Just look out for the stickers on the vehicle. All drivers have passed a locality test and are DBS checked. Vehicles are checked every 6 months by Newcastle Council. .
Newcastle Hackney Carriage Drivers Association was set up in February 2018 and helps drivers & vehicle owners with issues within the trade. If you would like to view the website please check out www.nhcda.net. We also have a Twitter account along with Facebook and Youtube. All our drivers are self-employed. We are classed as "sole traders". We pay UK tax to HMRC & contribute into the UK System. All drivers have passed a DBS check. The Disclosure and Barring Service will check for any driver criminal records etc. All drivers have passed a locality test unlike a huge percentage of Private Hire Uber drivers. See below for more info. Get £15 free. Click here to download the Gett taxi app. You will receive £3 off your first 5 rides with Gett. Invite friends to Gett and earn upto £500 in free rides. Superb customer interface. Easily place order for closest taxi. Book either Black cab or Wheelchair access vehicle. No surge ever. Offers for loyal customers. Live chat box for customer services. All drivers have passed a locality test. All drivers are insured and have been DBS checked. Rate your driver. Make a change today and see the difference in quality. You'll be surprised with our tariff rates. Stop using services that increase fares when it's busy. Thats not customer friendly. Stop using services that may take customers sensitive data from their mobile phones. Do you know which app permissions you agreed to when you downloaded Uber? Did you know that once the Uber passenger app is installed on your mobile phone you agreed to permissions. These permissions allow Uber to use your camera, microphone, to search your contact details, read your SMS messages, check your storage and much more. Is Uber reading your SMS messages? In 2016 Uber changed their terms and conditions. Please read here. You may have agreed that Uber can now access your SMS messages. You are advised to check with the permissions you have agreed too. If you're unhappy with this you should uninstall the app. Reddit user "constituent" made users aware in 2017 that Uber want access to your bookmarks, web history, and running apps. See the thread here. Why do they need this information? They also ask for camera permissions, storage access, & location . If you want to protect your privacy please look at the permissions you are giving Uber and decide if you are happy giving this away for free. What permissions do you give to a Cabbie? None! Please join our Telegram group now. Chat live to Newcastle Hackney taxi drivers who will explain the reasons why you should use a black cab. You can try to locate lost property or even book a licensed taxi. Check which taxi ranks drivers recommend, where to go in Newcastle for a night out or whats happening live in the City centre with traffic updates. Download telegram first then click the link below. Most drivers offer customers the option of paying by Visa, Mastercard, Amercian Express, Apple Pay & Google Pay. 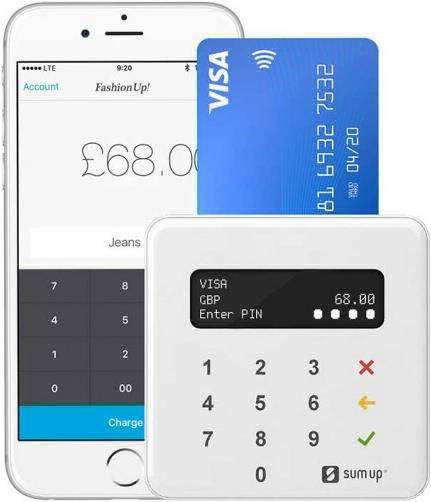 Drivers can order a card reader today for only £15.00 - link. Don't have cash......not a problem.